Last month, US President Barack Obama skipped Nigeria on his first official Africa trip, in what was seen as a snub for its record on governance. "Nigeria is undoubtedly the most important country in sub-Saharan Africa," Assistant US Secretary of State for African Affairs, Johnnie Carson, was quoted as saying by Reuters news agency, en route to the Nigerian capital Abuja. 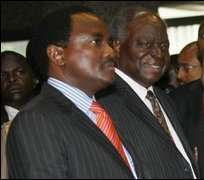 But Mr Carson said it had also been described as "the most corrupt state in Africa". President Yar'Adua came to power in a widely criticised election in April 2007. On Wednesday, Mrs Clinton is scheduled to hold a private meeting with representatives of the country's political elite, with democracy and corruption said to be on the agenda. And she is expected to seek an update on the status of a 60-day amnesty period in the Niger Delta, declared in an effort to end years of militant attacks that have hobbled the oil industry. Mrs Clinton's visit comes in the wake of clashes between a radical Islamist sect known as Boko Haram and security forces in Bauchi and three other north-eastern Nigerian states. On Tuesday, Mrs Clinton demanded an end to widespread sexual abuse in war-ravaged eastern Democratic Republic of Congo, during a visit to the country. She spoke out during a tour of a crowded refugee camp in the city of Goma. She leaves Nigeria on Thursday for Liberia and will round off her trip in Cape Verde.